Scattered far and wide under alien skies in adversity and triumph they played their part with stout and gallant hearts. True to their tradition they answered the Empire's call with soldierly discipline and fortitude. Staunch in the loyalty they have ever displayed towards the throne and person of the King and Emperor, they made his cause their own, and willingly laid down their lives for their Sovereign. These men showed as true the heart of India, and through them we know the soul of India has only to be touched aright and India will respond to the King and Emperor's call. How great that effort was and how valuable is seldom realized by the rest of the Empire. "When the war broke out, only one British colony was ready with a standing army. It was INDIA". When the war trumpets sounded in Britain in August 1914, the echoes carried to the corners of the Empire. The call brought forth an extraordinary display of solidarity. For soldiers of some of the self-governing British Commonwealth nations, involvement in the First World War was a matter of honour and a rite of passage. It is important we do not forget that shared endeavour and that we continue to pass the lessons of that terrible war on to younger generations. On the outbreak of World War 1, the combatant strength of the Indian Army, including reservists, was 194,000 Indian ranks; enlistments during the war for all branches of the service amounted to 791,000, making a total combatant contribution of 985,000. Of this number, 552,000 were sent overseas. About non-combatants, the pre-war strength was 45,000; an additional 427,000 were enrolled during the war; and 391,000 were sent overseas. The total contribution of Indian personnel has thus been 1,457,000, of whom 943,000 have served overseas. The CWGC commemorates a total of 161,219 servicemen and women from Undivided India in fifty countries across the world, wherever they fought and died. 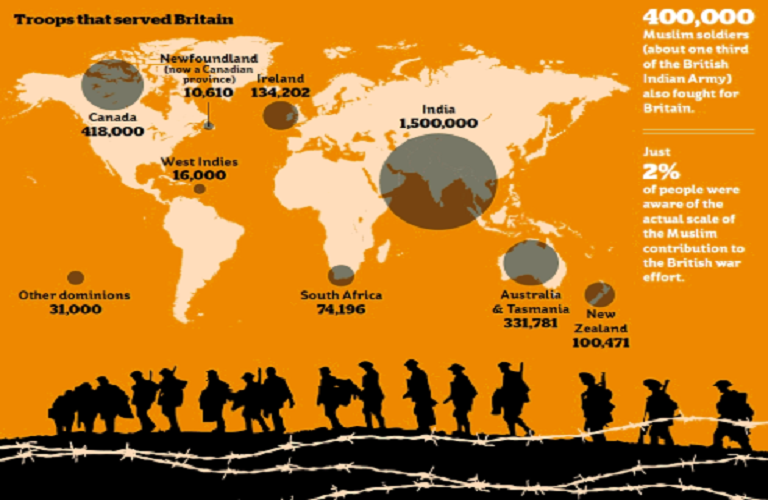 Over one million Indian troops volunteered and served overseas during WWI, and of these, 74,187 Indian soldiers died and more than 67,000 were wounded. 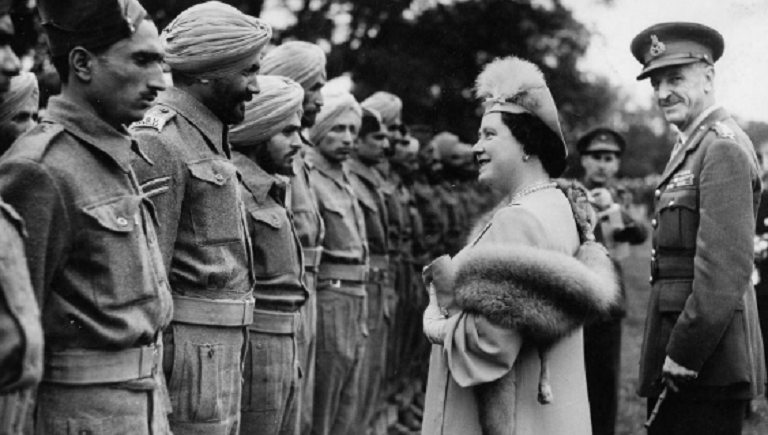 By the end of the Second World War, Undivided India had provided the largest volunteer force in history, comprising over 2,500,000 servicemen and women. India's net military expenditure increased from about twenty million pounds in 1912-13 to an estimated forty million pounds in 1940-41. India played an immense part in empires war effort. India's central geographical position, vast and varied natural resources, great reservoir of man power and considerable industrial equipment mark her out as an ideal supply base for all points of strategic consequence from the Middle East to Malaya. During the year the average monthly output of the Army Clothing Factories rose to three times the normal yearly output before the war, and in one month reached its maximum figure of two million garments. Over a million and a half pairs of boots were supplied against army demands in the 12 months preceding the armistice. The output of the ordnance factories also showed a steady increase. With the object of setting free the plant of government factories to meet immediate and specialized demands as they arose, the outside manufacture of war stores was encouraged as much as possible by instruction in methods of manufacture, and by the provision of raw material, patterns and specifications. The inauguration of extensive schemes of irrigation and agricultural development in Mesopotamia made heavy additional demands on India during the year; the extension of the railway system in the same theatre continued to make serious inroads on available rolling stock and material During the war, 1,855 miles of railway, track, 229 locomotives and 5,989 vehicles have been sent out of the country. With Japan's entry into the war, India came between two fires. She had to provide an army to fight in the East. She raised, trained and equipped an army of 2,500,000 volunteers. Auxiliary work for this force employed 8,000,000 Indians, war industries absorbed 5,000,000 and increased pressure on the railways was met by 1,000,000. By December 7, 1941 India had shipped westward a quarter of a million troops, more than Britain or any other Commonwealth country had contributed at this stage. In the early part of the North African campaign, India was solely responsible for the supply of the pipe lines, rolling stock and loco motives, and she tore up 1200 miles of her own railway line for use overseas. Before the war. India's few shipyards built small craft and were capable of minor repairs only. During the war, many hundreds of vessels were built, ranging from minesweepers to barges, and 6500 ships, of a tonnage of 38,840,000, were repaired in 56 yards. Over 200 fully equipped operational airfields were constructed. In addition, seven huge bases, each with runways over a mile long, were laid out for the American Air Forces, flying supplies to China. The importance of cotton textiles as supplies for war purposes is greater than ever it was. The soldier's wardrobe counts for much under modern conditions, and during active service quantities of absorbent gauze, bandage cloth, and so on, are needed for dealing with injuries. India supplied US Forces with 44,000 miles of cotton cloth in 1944 and 28,000 miles in 1945. Chinese forces received 11,000 mile of cotton cloth. Textiles other than cotton supplied were 20,000 miles in length. India's steelworks produced up to 1,500,000 tons a year, the material for railway tracks, bridges, floating docks and machine tools. Ordnance factories manufactured machine guns, field guns, bombs, depth charges, mines and other weapons. Indian factories produced 4,500,000 parachutes. All the supplies dropped over Burma, totalling 609,717 ton in a single year, were carried in Indian made parachutes. Clothing factories produced 400,000,000 tailored items. Indian leather was made into 50,000,000 pairs of boots by Indian workers. Every jungle green uniform used in Burma was made in India. To assist the Russians, a 3000-mile supply road was built through North west India and Persia into Russia. One and a half million tons of stores were poured along this highway into Russia. The Fourteenth Army in Burma was the largest single Army in the world. Its battle front of 700 miles was nearly as long as the Russian front against Germany, of the total force of 1,000,000 employed in Burma, 700,000 were Indians. India was the third largest consigner of supplies to Australia during the Pacific War. "Indian jute bags are cushioning Great Britain against air attacks and her cotton and woollen mills are busy executing British military orders." 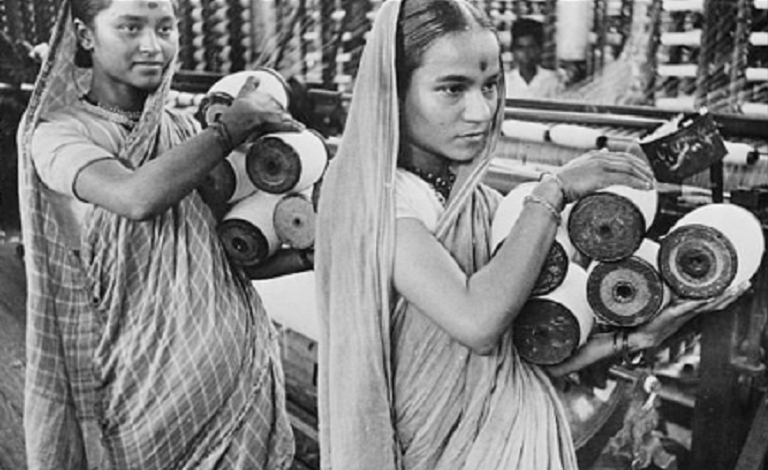 The jute mill industry is the second largest textile industry in the world. The contribution of the jute mills to the war effort may be said to have started from the time when precautions against air raids became intensified in Britain. Early in 1939 the British Government ordered 200,000,000 sandbags, and orders for different classes of fabrics for war requirements have followed in fairly large quantities the jute mills employ a daily average of nearly 300,000 workers, and it is no exaggeration to say that the whole of the economic position and prosperity of Bengal centres round the jute industry. TEA accounts for about a third of the whole annual value of the United Kingdom's imports from India, but no other Indian industry exports to the United Kingdom annually even half as much as the tea industry. When war became imminent leaders of the tea industry recalled the importance of tea in the war of 1914-8, when it was the never-failing stimulant and they were determined that there should be no lack of tea for Britain in time of need. The principles were laid down that Britain must have all the tea she wanted and that there must be no profiteering. Since then tea rationing has come into force in Britain, but it is a rationing based neither on any shortage there nor on any failure of supply from India, but rather on the determination of the British authorities to conserve all supplies of essential commodities in the early stages of the war. There is the interesting psychological phenomenon that in air raids or other times of stress, when courage and resistance require strengthening, tea is particularly in demand. By imagining the shock to the morale of sailors, soldiers, airmen, and civilians if Britain were without tea. Tea is only one thing. 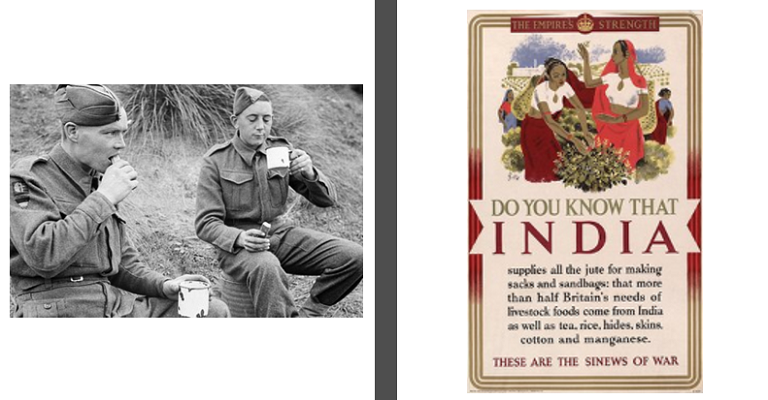 Whether it is jute bags or cotton goods, food grains or footwear, men or money, India man supply the needs of Britain. The lapse of time is no doubt blunting the keener edges of memory, but those who lived through the war, and especially those who took part in it, can never forget those tragic years. Nor is it well that they should forget. Though we enjoy our freedom we tend to overlook the enormous cost that was paid to secure that freedom. We owe a great debt of gratitude to our soldiers past and present who have paid the price with their lives.